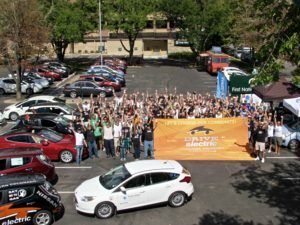 Drive Electric Northern Colorado successfully achieved the largest electric vehicle (EV) rally in Colorado history! On Saturday, September 17th, as part of National Drive Electric Week, 83 EVs poured into the First National Bank parking lot in Fort Collins, Colorado and made history. This was an important milestone for the region as Drive Electric Northern Colorado has been working to turn Northern Colorado into an EV community for more than three years. The goal of the National Drive Electric Week EV Rally was to demonstrate how many EVs are now on the roads in our community, both to continue encouraging EV adoption, and to recognize those community members who are already plugging in. 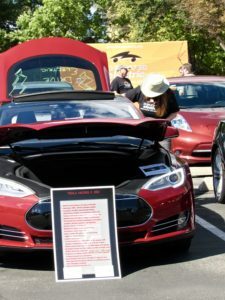 The event featured EVs from most major manufacturers including BMW, Chevy, Ford, Nissan, Tesla, and Mitsubishi, plus ZeroCycles, Codas and several other models. Owners proudly displayed their vehicles and encouraged people to check them out. One Tesla owner even brought informational posters (shown above left) and a sample Tesla battery to display. Another Tesla owner, Patrick Lawson, who drove five hours from Riverton, Wyoming to be at the rally, displayed his Model S with two kid-friendly seats in the trunk. He encouraged parents to let their kids test out the rear-facing seats (see below). William Adams, owner of an electric motorcycle, mirrored Lawson’s sentiment about electric vehicles. The event demonstrated an overwhelming sense of how much EV owners love their vehicles. Whether it’s the savings on fuel and maintenance, the instant acceleration, the environmental benefits, or the futuristic look and feel, people can’t get enough of their EVs. After over an hour of mingling, the EV owners and their families gathered for a commemorative photo of this achievement. With 117 people and 83 vehicles, the group set the bar high for future EV rallies in Colorado. 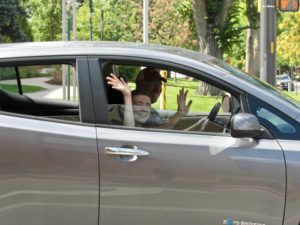 To conclude the rally and demonstrate the high rates of EV adoption in northern Colorado, attendees participated in a mass drive through Old Town Fort Collins. 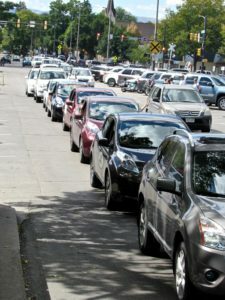 During the “EV Flash Mob”, all 83 EVs, from fleets and consumers alike, overwhelmed the streets of Old Town Fort Collins, lowering traffic noise and the smell of exhaust. For 30 minutes the pedestrians took note of the excitement and began understanding why the Northern Colorado community is working hard towards widespread EV adoption.